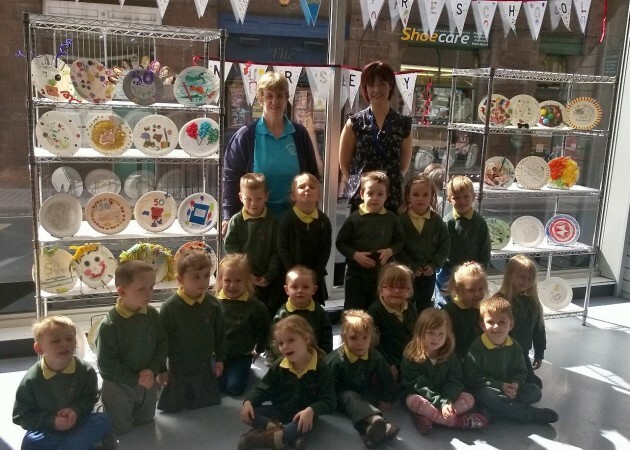 Lynda Russell and Katie Kipling with the preschoolers and their plates. Celebrations to mark the 50th anniversary of Penrith Preschool Nursery have received a welcome boost from Lakes and Dales Co-operative (formerly Penrith Co-operative). Lakes and Dales Co-operative has donated vouchers to help with the 50th anniversary celebrations and will also be proudly displaying plates decorated by the preschool and nursery pupils as part of a special art competition. The plates will be on display at the Penrith Co-operative store until 9 May 2014. As part of the 50th anniversary celebrations, the Preschool is holding an open afternoon on Saturday 10 May, with activities and games for the local community to enjoy. The lucky winner of the nursery’s plate decorating competition will also be announced at the event. Lynda Russell from Penrith Preschool Nursery said: “We’re proud to be celebrating our 50th anniversary this year. We were originally set up in 1964 by a group of Mums in Christchurch Parish Rooms, moving to Meeting House Lane in 1979, where the preschool and toddler group has grown and flourished by providing early years education and places for children aged 16 months to four years, for families throughout Eden and the surrounding area. Lakes and Dales Co-operative is the new trading name for Penrith Co-operative, following the merger with Scotmid Co-operative Society. There are nine Lakes and Dales Co-operative stores in the Eden Valley and Lake Districts in Cumbria, and the Weardale Valley in County Durham.